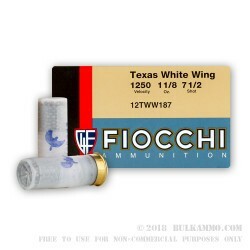 This 12 Gauge shotshell has been optimized by Fiocchi to best suit the needs of the white-winged dove hunter, although it will perform admirably at taking other similarly sized upland game birds. It is very fittingly loaded with 1 ⅛ ounces of dove shot -- or #7.5 lead shot, to be more precise. 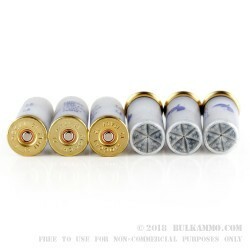 The .095” diameter pellets have great stopping power at ranges between 35 and 50 yards, but aren’t hefty enough to destroy smaller trophies beyond recognition from those distances. This shell features a special mesh-type wad that collapses when it is fired. This provides less felt-recoil, and also protects the shot and tightens its pattern downrange for the kind of consistent performance you need while taking small and flighty game. 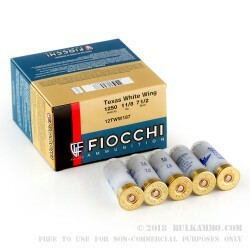 As one of Italy’s oldest and largest ammunition manufacturers, Fiocchi possess the experience and the wherewithal to make high quality shotshells. They have a strong presence here in America, where they constantly implement our hunters’ feedback to stay at the cutting edge of their industry.